The field of stress analysis is extremely highly developed. The foundation was secured through countless classical analyses, and now the approach is widely practiced through finite element codes. However, understanding the limits of performance in terms of allowable stress levels is not commensurately highly developed. 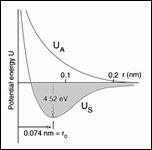 The limits of performance are now finally and firmly being recognized as an entire discipline in and of itself and this will lead to much more reliable materials applications. Now some examples of applications will be given. The purpose is not to evaluate and compare with data, that is covered in Section VI. Rather, the intention is to show the extraordinarily broad range and vitality of failure theory applications. All ductile metals are at or very near the strength ratio T/C=1, but all other materials classes such as polymers, ceramics, glasses, and geological materials have broad ranges of T/C’s. Examples from the various materials classes will be used with particular but realistic values of T/C in each case. These examples will range from very ductile polymers to extremely brittle geological materials. There is no need to cover ductile metals in the examples. They have been exhaustively treated in many places for a very long time. The Coulomb-Mohr failure theory was completely discredited by von Karman and by Böker not long after Mohr finished its development. That situation has been revisited and re-evaluated in Section VI, with the same end result. Still, it is useful to show Coulomb-Mohr results here in the examples in order to compare it with and calibrate the new, comprehensive failure theory. The coordination refers to the physical basis for the inception of the fracture criterion at T/C=1/2. This is a necessary and integral part of the failure theory, see Sections II and VI. The two failure mechanisms are competitive, whichever one gives the lesser allowable stress is controlling. In the examples these two criteria will be referred to as the Failure Criterion and Fracture Criterion respectively. 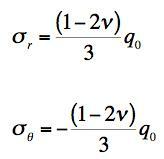 In the examples this will be referenced as the C-M Criterion. 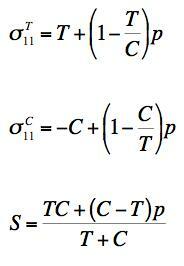 Of course the Mises criterion is unaffected by pressure. It is seen that the worst of the three predictions by the Mises criterion is for uniaxial compression, and it differs from the data by a factor of 2.0. Incidentally, the total square error for the predictions from the C-M Criterion is 15.4%. Thus even at a reasonable pressure of p=2C these polymers show a wide difference between the two predictions. The differences widen even further at larger pressures for all three strengths. Furthermore, the effect of the pressure has a very strengthening effect on the strengths themselves. Timoshenko and Goodier  note that many indentation experiments on glass have verified this location for the failure. Infact, it even goes back to the original experiments of Hertz. 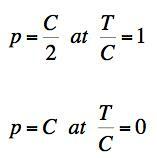 The shortcoming of the C-M Criterion in part relates to the fact that it does not account for the intermediate principal stress, σ2, in its formulation. There is seen to be a major difference in behavior for three dimensional pressure from that that occurred in Example 4 with two dimensional pressure. 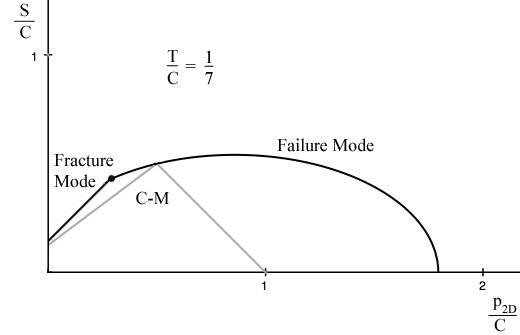 In this example the C-M Criterion is mostly unconservative relative to the present failure criterion, whereas in Example 4 it was conservative. 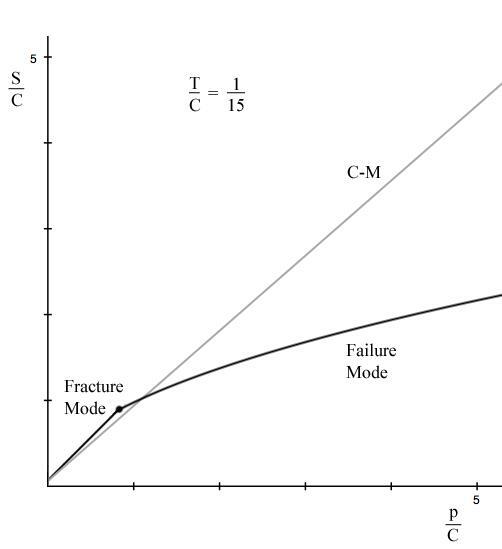 The present example is much like that in Section VI where the test data for dolomite were found to bifurcate away from the fracture mode and follow the failure mode as pressure increases, rather than following the straight line projection of C-M. This is the problem of a tunnel buried under a large overburden, or equivalently a cylindrical cavity under far field hydrostatic pressure. This nondimensionalized behavior is not only reasonable, it is necessary. The mean normal stress has no effect on the strength at T/C=1 but for lesser values of T/C a compressive mean normal stress does have a strengthening effect. Also, it must be remembered that as the material T/C diminishes, the absolute values for T and C individually also diminish greatly due to the greater degree of damage that exists at smaller T/C’s over the spectrum of materials. As seen from the examples, sometimes the C-M Criterion is conservative and sometimes unconservative relative to the present theory. It is not possible to state a general rule that covers all cases. However, when all the principal stresses are predominately positive or all predominately negative then it can be shown that the C-M Criterion is always unconservative, sometimes extremely so, as in Example 5. In contrast, the present failure theory relies upon its physical development with experimental verification for realistic applications. Future world-wide applications will be designed to integrate the basic function with life cycle costs, efficiency, safety, durability and possibly several other requirements. Specific applications that reflect the new approach likely will include green aircraft, efficient automobiles, durable wind turbines, and many other emerging technologies. Such applications as these will in many cases necessitate the development and qualification of entirely new materials. The opportunity to understand and apply materials failure theory to these problems is completely open and the incentive is considerable. Pae, K. D., (1977), “The Macroscopic Yielding Behaviour of Polymers in Multiaxial Stress Fields,” J. Mats. Sci., 12, pp. 12099-1214. 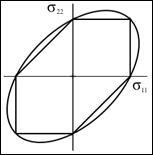 Timoshenko, S. P. and Goodier, J. N., (1970), Theory of Elasticity, 3rd ed., McGraw-Hill, New York.